Shown Tonight, Friday 19th June at 9pm on Channel 5. More pictures from this show are HERE. In tonight’s show, Chloe, Harry, Cristian and Jade are facing eviction. The Housemate who receives the most votes by the public, will be the eigth person to be evicted. Apparently, the plan to put former housemate Aisleyne Horgan-Wallace in the house has been scrapped for now. Cristian is dishing out his opinion to a number of housemates. Danny and Helen 'come to blows'. Some of the original Housemates question Joel’s loyalty. On tonight’s “Bit on the Side” at 10.30pm on Channel 5 guests include; comedian, Matt Richardson, The Only Way is Essex star Bobby Norris, Benefit’s Street's White Dee and mother and daughter BB14 team, Jackie and Charlie Travers. · It’s morning and Marc is excitedly running around the garden screeching and annoying some of the housemates. Some of the housemates are in the bedroom discussing Marc and their irritation at his behaviour. Brian says, “It’s bad on a nice day, everyone wants to sit inside.” Marc comes into the bedroom and jumps on some of the beds. He tries to get a reaction but no one really responds to him. · Big Brother has gathered the Housemates in the garden for today’s task. Earlier in the day, the Time Warp Housemates were asked to fill out a questionnaire about their fellow housemates. Now, the Time Warp Housemates are seated on four chairs in front of the others. Nikki is not enjoying the task at all. The Housemates are having fun with the task. Chloe chooses to pick Marc purely so that she can pour fish over Marc. 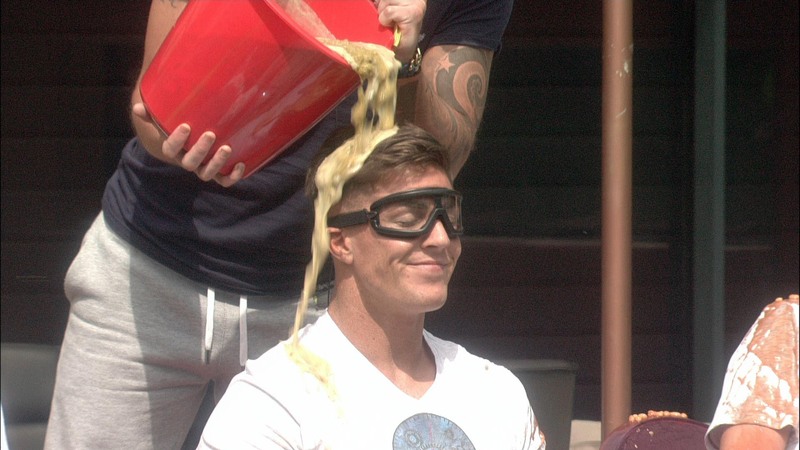 Housemates have successfully passed the task and will be rewarded with a dinner for the entire house. Nikki is disgusted and runs to the shower to wash all the gunge off. · Danny is talking to Marc about Cristian’s behaviour, telling Marc to leave him to behave how he likes. Marc says, “Go out being who you are.” Cristian comes into the garden. Danny tells Marc he’s contradicting himself as he’s nominated people for being boring and now that they are responding to that, he can’t criticise it. Cristian says, “Lots of people are brown nosing.” Danny says to Marc, “I’d say you’re so far up Helen’s arse” Cristian agrees. · Helen and Jade are in the bedroom. Jade is relaying her conversation with Cristian. Jade also says, “He insinuated that Marc is up your arse and you love him.” Helen says of Cristian, “He’s no personality. I’ve heard him speak more in the last forty eight hours than in the last five weeks.” Helen impersonates Cristian. · Marc is in the living area with some of the Housemates. He is telling them what Victor whispered to him and says, “[He said] You were doing tops. Stay away from Helen. She’s bad news. In other words, I ruined it by talking to Helen.” Helen responds by saying that she doesn’t like him, “He’s trying to **** stir.” Danny repeats that he thinks Helen’s approach is disrespectful saying, “You let yourself down.” Helen says, “You can’t tell me what to do. Your friend can ******* die for all I care.” Danny is visibly annoyed. Helen continues, “Telling the truth is fair. If the guy was alive or dead, I don’t care.” Danny gets up to walk away saying, “Don’t get personal and say I don’t care if you’re alive or dead.” Danny loses his temper. He swipes some of the pizza boxes onto the floor and goes to the store room to cry. Brian rushes to calm him down. · Brian is talking to Cristian and Jack in the bedroom. Brian says, “She’s got something to prove when she came in here.” Jack says of Joel, “I feel like I’ve been stabbed in the back from him.” Danny joins the boys in the bedroom and heads to bed. · Marc is having a conversation in the kitchen about factions in the house. Chloe asks him what factions he’s talking about. Marc responds by telling her she’s getting involved in a conversation that doesn’t concern her. Chloe takes offence. They have an argument and Chloe goes to the bedroom and starts crying. · Helen is in the Diary Room justifying her argument with Danny. “I’m really annoyed. Danny got on his high horse. I didn’t mean to upset Danny. The way he goes on it’s like he’s in the right all the time. This is all just through being ******* honest. No one likes the truth in this house,” she cries.